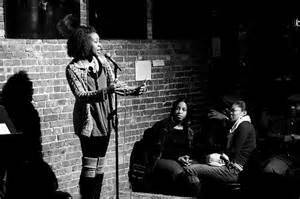 Slam poets compete against one another, but also collectively as teams. Teams are generally organized around performance venues, their local slam homes. They compete with neighboring teams to hone their skills and sometimes compete in regional team slams for bragging rights. When they feel ready, they might step up to compete in the big top, the annual National Poetry Slam. P4 has compiled a list of slams from information provided by Poetry Slam, Inc., the Nationals promoter, and from scouring the Internet. The information is searchable by Province or State, and City to help you find a team and its venue near you. P4 tracks all the basic information we can about each slam, but click on the link to the slam's websites for full details. IMPORTANT: Note that this listing contains both active and inactive slams. If you want to search only active slams, be sure to select that option before your search. Try as we might, no list of slam teams or venues can ever be complete or up-to-date. Teams form and dissolve and venues shift from place to place or go out of business, all without notice. If you see any errors or oversights in this list, please get in touch. We’ll do our best to update our list with your information. Thanks. If you are an organizer with any of these venues, or know of any slams that are now listed here, definitely let us know!